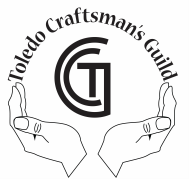 The Toledo Craftsman's Guild recently updated its Constitution and Bylaws to allow non-Guild/guest artists and crafters to participate in two of our shows. The venues for these two shows are quite large, and we would like to fill the area completely with additional artists and crafters. To apply to a show, download and print the PDF below. Complete the application and mail it with the required photos and additional information by the deadline. Applications will be accepted after the deadline only if space is still available.